For the majority of people that I meet, making tea involves boiling water in a kettle then pouring the contents over a teabag in a cup. It’s fast, it’s simple, and you get a… cup of tea. For me it’s hard to go back to that after growing up with good tea. I grew up with loose leaf tea, usually a selection of Darjeeling, Chinese (of one sort or another), English Breakfast, Earl Grey, or Irish Breakfast were always on hand, along with a few others that we were trying at the time. My dad insisted that the pot must be warmed before the tea was made in it. Yes, it made a difference in the flavour. It is my understanding that this is a very English way of making tea. Other cultures have other ways of making tea. The Persians (the ones I know anyway) like to make a VERY strong pot of tea. Then they can pour out just a little into a cup and add hot water to it to bring it to the desired strength. An easy way to serve tea to a lot of people at once. The best tea I ever had though? – When a friend of mine invited me for a traditional Chinese tea. He preheated the little clay teapot. 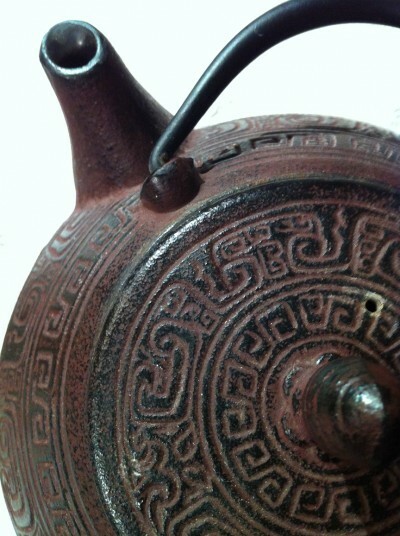 This teapot only had one kind of tea ever made in it, and you don’t wash them with soap because the soap would get into the pores of the clay and ruin the flavour of any tea made in it afterwards. The water was heated to just the right temperature in an electric kettle/caraf-like device that only heated it up to that point and never higher (available in many Asian shops like T&Ts). The water was poured over the tea leaves and allowed to sit a moment, then it was poured off. This was washing the tea, and you didn’t drink this liquid. Once that was done he poured fresh heated water over the tea leaves again. After letting it sit for a short time he poured this liquid into little cups about the size of half a chicken egg shell. Any in the pot was poured off to preserve the tea leaves. This process was repeated about 6 or 7 more times. Each time the tea tasted slightly different, and the fifth one (as he had promised) was the tastiest of all! While you might not want to make tea that way every day, you can learn a little from the process for making tea quickly and easily that has great flavour. wash the leaves, especially if you are using whole leaf teas like Oolongs. This helps remove the bitter flavour (and perhaps dust caught in the leaves) that some teas might otherwise have. when the tea gets to the colour and taste you want, remove the tea leaves from it. I like to pour the tea into a thermal carafe or thermos for my day’s supply. We have a number of teas for your enjoyment in the online store. Take a look.